North Tahoe senior Koby Mattson went 10 for 10 at the plate during the El Capitan Tournament in Hawthorne this past weekend. Seeing a baseball diamond not buried in snow has been rare for the North Tahoe baseball team. 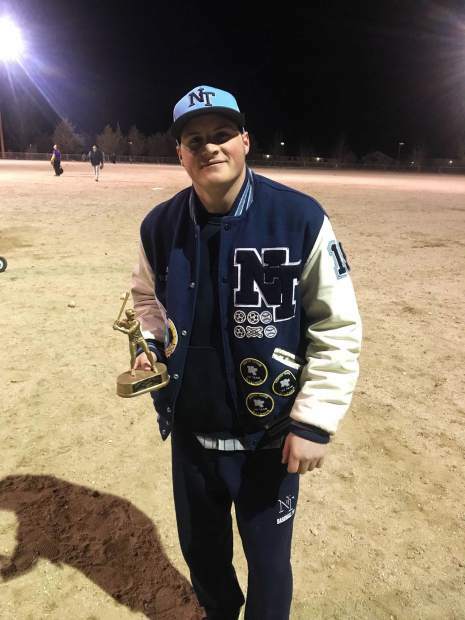 Still, a lack of live action due to a field covered by several feet of snow couldn’t quell the red-hot bat of senior captain Koby Mattson, who went 10 for 10 from the plate and drove in 15 runs during last weekend’s El Capitan Tournament in Hawthorne, Nevada. During Mattson’s 12 plate appearances, the senior swatted a pair of doubles, was walked, hit a sacrifice fly, and scored eight runs. Mattson also defended his home run derby title from a year ago, launching two balls out of the park in Hawthorne. The Lakers went 4-1 during the two-day El Capitan Tournament, taking wins against Mammoth, Lone Pine, and Mineral Country. North Tahoe split a pair of games against league rival Silver Stage. For the tournament, the Lakers finished in second place, going 4-1. Mammoth won via a tiebreaker for fewest runs allowed. Mattson and senior Xander Kriston earned all-tournament honors. Kriston drove in four runs, hit a pair of doubles, and swiped four bases during the tournament. From the mound, Kriston led North Tahoe with six strikeouts as part of a combined 24 batters fanned by Lakers pitchers. Junior Jaxon Pokorny knocked in four runs. Pokorny scored seven runs during the tournament and had five hits, including a double. Senior Danny Sandoval had four hits, three stolen bases and three RBIs. Junior Juan Rey Garcia, senior Sam Sheridan, senior Jan Michael Castro, and sophomore Nathan Whisler combined for seven RBIs. North Tahoe will open league play on Friday with a three-game series against Battle Mountain. With roughly eight feet of snow covering the field at North Tahoe, according to Brown, a season without a home game is a possibility for a Lakers team that has been relegated to practicing in the high school’s gym to open the program’s 2019 campaign. The team’s scheduled games for March include road trips to Battle Mountain, Ely, and Yerington, followed by a road contest at Pershing County in Lovelock to begin April.